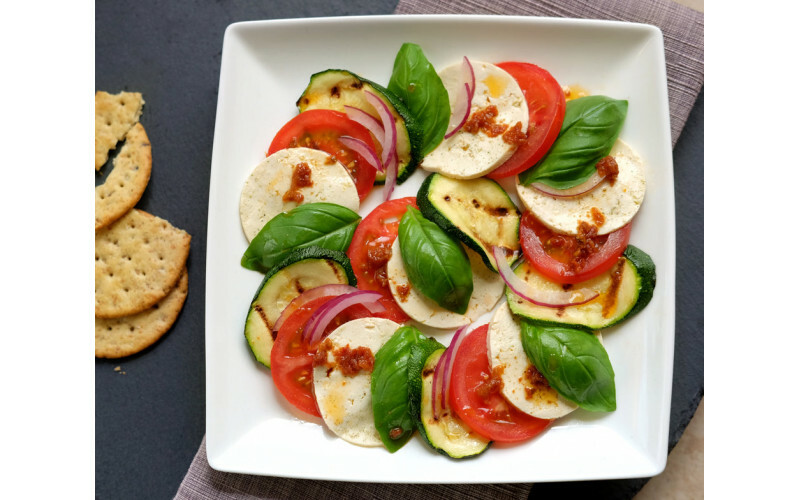 A lovely fresh recipe from Flavourphoto's Chava Eichner that uses tofu instead of the traditional mozzarella. This high-protein salad can easily be made more substantial with cooked wholegrains, more salad, bread, crackers - you choose. Alternatively, a good vegan mozzarella - eg Mozzarisella - will make the recipe quicker but not so protein-packed! Using pressed tofu in this recipe allows it to absorb the marinade a lot better. It also makes it much easier to slice thinly. Most supermarket plain tofu - eg Cauldron - is only medium firm, although it will work. However, some health food shops and most Oriental stores sell extra-firm tofu, which is fantastic for recipes like this. Use a press of any type – the home-made version involves wrapping the tofu in kitchen roll or similar then placing it in a colander or sieve. Top all this with a plate and heavy weights, eg tinned food or scale weights. Alternatively, use a ready-made pressing box, like the green and white box pictured, and cover that with heavy weights. For all the lowdown on tofu - the different varieties and how to use them etc - click here! Press the tofu overnight to remove all excess water. If you want to opt for the authentic mozzarella shape, cut the tofu in very fine slices and use a circular cutter to stamp out some circles. (Any cut offs can be used for other dishes.) Alternatively, simply cut the tofu block in half and slice thinly. Prepare the tofu marinade by blending together 3 tablespoons of olive oil, the white wine vinegar and a generous pinch of sugar. Pour a third of the dressing on a large platter and place the tofu slices on top. Using the back of a tablespoon spread most of the remaining marinade evenly over the tofu. Season with the herb salt (see tip). Set aside and let the tofu absorb the flavours for at least an hour, longer if possible. In the meantime grill the courgette slices in a griddle pan. Brush with any of the leftover marinade and season with black pepper and salt. Arrange tomato slices, grilled courgette, marinated tofu and basil leaves on a big serving plate. Blend all dressing ingredients together and drizzle over the salad. Serve with crackers or fresh, crusty bread. * Tip: Herb salt makes a really nice addition to your spice rack. My favourite is Herbamare from Holland and Barrett and other independent health food shops.